Dr. Gilligan, Chief Scientific Officer at AcnEase, collaborated with me today to clarify the facts about teen acne. Acne is a part of many teen lives - unfortunately. And they will do anything to get rid of it - who wouldn't!? HOWEVER, there are some important safety alerts both smart teens and their mothers need to know before choosing an acne treatment. Reason being that MANY of the most commonly prescribed regimens do have side effects you need to know about. Weigh the benefits and potential dangers - after all, an educated consumer is a safe consumer. Here are some of the potential treatments you need to be alerted to. To date, the only FDA approved drug that reduced sebaceous gland secretion was Accutane (Isotretinoin) and its generic forms. Unfortunately, Accutane and Isotretinoins are associated with a number of very serious side effects. Accutane has actually been taken of the market and is currently the subject of a class action suit for its adverse effects. Generic brands are still prescribed with many not knowing that these are the SAME drug as Accutane with the SAME potential adverse effects. And you have no legal recourse if you are negatively effected by them since they are the generic form of the drug. 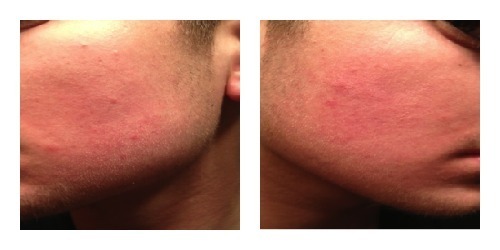 Topical products containing salicylic acid and benzoyl peroxide (that are so often a part of a teen acne routine) offer a short term and very limited help as they do not have an effect on the sebaceous glands but rather are applied to existing pimples; therefore this approach has limited impact on the cause of acne. In addition, those topical agents dry and sensitize the skin (which can worsen acne) and increase sensitivity to the sun's UV rays, increasing skin cancer expectancy. Other systemic remedies include the use of broad spectrum antibiotics like Tetracycline, Erythromycin or Minocycline, which are administered to inhibit bacterial growth in the sebum filled clogged pores. The antibiotics also DO NOT reduce sebum production but rather target the bacteria that propagate in clogged pores. The chronic use of broad spectrum antibiotics is discouraged due to the development of antibiotic resistant strains of bacteria. Also, ALL antibiotics will increase the skin sensitivity to UV light (teens may be forgetful about sun protection!) and several may cause stomach issues. For teen women, there is a trend to prescribe oral contraceptives as acne treatment to overcome the natural fluctuations in hormone levels that occur during puberty and later with the menstrual cycle. The use of products such as Diane-35, which contains an anti-androgen (cyproterone) and a form of estrogen (ethinyl estradiol), has also been associated with severe side effects including venous clots and even death (it is now banned in most of Europe and Canada and several other countries). Oral contraceptives (OC) have their own warnings, and most are used in an off-label manor. Eleven brands are presently under warning by the FDA for the potential serious adverse effects. So what do you do if you or your teen is struggling with acne? Many mothers (and teens) contact us with their emotional stories, looking for an alternative to chemical drugs. Some have even been victim to the side effects that we've mentioned. We're here to give you the facts for you to make your own decision. So learn the facts and make your own decision. Look for credible sources and ask many questions. Be a part of the decision process. This is your body! for acne that has up to a 98% success rate not just for mild or moderate acne, but also for cystic, chronic and severe acne. No side effects, no chemicals, all botanical, no phyto-estrogens and is even gluten and sugar free. 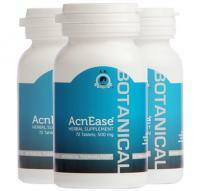 AcnEase® has a direct effect on decreasing sebaceous gland secretion - the factor responsible for pimple formation. AcnEase® does not have a direct effect on hormone levels but rather reduces the influence of fluctuating hormone levels on the sebaceous glands and consequently reduces sebum production, the initial step in the acne cascade. Since teen acne is intimately associated with fluctuations in hormone levels, AcnEase® is an ideal product for the treatment and prevention of teenage acne. Just keep in mind that as you're searching for an acne treatment, it is beneficial to stay open minded while also seriously considering the validity of the sources you use and weighing all of your options. Make sure YOU are the one to make the decision, and that your choice feels right. Ask us questions anytime and we'll be glad to give you the facts! My son 16 year old son is dealing with mild/moderate acne issues. If you look at him from the side you would never believe he has acne. However, the front side view is bothersome for him. He has acne on his nose, middle forehead and chin...it gets really bad, but whenever he swims in his friends salty pool his face clears right up. I was wondering if you knew of a product that has salt as an ingredient for acne??? Whatever else is in that salty pool works wonders on his face. Crazy but true! 63 1 My son 16 year old son is dealing with mild/moderate acne issues. If you look at him from the side you would never believe he has acne. However, the front side view is bothersome for him. He has acne on his nose, middle forehead and chin...it gets really bad, but whenever he swims in his friends salty pool his face clears right up. I was wondering if you knew of a product that has salt as an ingredient for acne??? Whatever else is in that salty pool works wonders on his face. Crazy but true!